Dar es Salaam — Government yesterday cleared the air over a commercial aircraft--Bombardier Q400--whose delivery had earlier been scheduled for July, saying it was currently underoing testing before landing in Tanzania. The government also assured that all planes that have been purchased since President John Magufuli ascended to power will be delivered in the scheduled times. Government spokesman Hassan Abassi made these revelations and assurances when highlighting the achievements made in the country under President Magufuli since taking office two years ago. According to Dr Abbasi, the plane will be delivered in the near future once it passes the required technical tests as per the set safety standards. The delayed delivery of the plane went unnoticed until August 16, when the matter was brought to public attention by Mr Zitto Kabwe (Kigoma Urban--ACT-Wazalendo) on his Twitter account asking the minister of Works, Transport and Communications, Prof Makame Mbarawa, to explain when the third plane would arrive and why the July deadline had been missed. Prof Mbarawa was quick to respond stating that the delivery of the plane was in final stages. When Mr Kabwe pressed him further asking him about the cause of the delay and whether the country was facing any debts that might have caused the seizure of the plane, the minister never replied. But it was during the August 18 press conference by the opposition chief whip Tundu Lissu that the matter attracted a huge public interest that prompted the government to respond. Mr Lissu (Singida East--Chadema) claimed that he had evidence showing that the plane had been seized in Canada due to the government's failure to pay compensation of $38.7 million (Sh83 billion) to the Canadian firm Stirling Civil Engineering. The firm had been contracted to construct the Wazo Hill-Bagamoyo road in Dar es Salaam but the government terminated the contract. The contractor then went to the International Court of Arbitration and won. However, on August 19, the government, through acting director of Information Department Services, Ms Zamaradi Kawawa, admitted that the aircraft had been detained in Canada but shifted the blame on the opposition accusing it of sabotaging delivery of the plane. Yesterday, Dr Abbasi said the government was purchasing four other aircrafts because of the complaints that the country was unable to attract tourists due to the lack of a reliable national carrier. He added, "The two CS300 will be delivered in next June, while the much awaited 787 Boeng Dreamliner is scheduled to be delivered in July as it was announced earlier". Presenting a summary report showing 10 areas of achievement attained in two years of the administration of President Magufuli, Dr Abbasi said the major achievement was the restoration of discipline in public service that has resulted in improved productivity and efficiency. At the event, which was live broadcasted, the government chief spokesman said another area was improved fiscal discipline within government entities hence ensuring value for money in all State run businesses and funded projects. 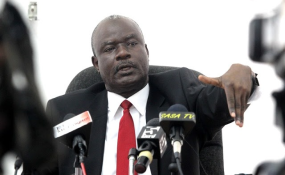 "It was within this period that the major scale public servants audit was conducted in a bid to remove ghost workers and those public servants holding fake credentials. The total number came to around 32,000 people, who were subsequently removed from government payroll," he said. According to him, a total of Sh378 billion was saved after cleaning the public service of ghost workers and unqualified personnel. From ghost workers alone a total of Sh236 billion was saved while Sh142 billion was saved after unqualified servants were sent home. "Currently, the government is working on filling in these positions left vacant after the clean up," he added. Dr Abbasi said the third area was anti-corruption war which saw the establishment of anti-graft court and dismissal of dishonest public officials. Fourthly was increased control on the protection of natural resources such as minerals, whereby Dr Abbasi cited the passing of three mineral laws that would ensure that the country benefits more from its extractive industry. The fifth area, according to him, is tightened financial discipline through controlling foreign trips for government officials as well as conducting cost effective workshops and seminars. "We have also succeeded in shifting the government seat to Dodoma. This has been a long time dream. It is now a reality," he noted. The government spokesman further noted that the country's dependency on partners has been reduced when it comes to implementing development projects. He said this was possible after raising government revenue collection from an annual average of Sh9.9 trillion to Sh14.5 trillion. "In this case the governments' capacity to deliver social services has increased," he cited such examples as provision of free education, implementation of water projects across the country, and increased budget for higher education loans. According to him, the initiation of the implementation of the Standard Gauge Railway (SGR) by using internal sources and revival of the national carrier were remarkable and historic achievements. Dr Abbasi also said that President Magufuli is determined to walk the talk in tackling issues that affect the common citizens in the country in line with the pledges he made during election campaigns. Industrialisation drive marks the tenth achievement, according to him, under the new administration in the past two years. "So far, we have revived 17 factories and created conducive environment that has attracted over 3,000 investors who are building factories all over the country," he explained.